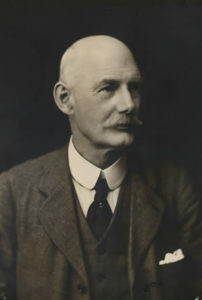 The son of John Shipley Ellis, the leading 19th century Leicester industrialist and entrepreneur, Bernard Ellis was born at Glenfield, Leics., and educated at Bootham School, York. In addition to his directorships of the family businesses he was very active in voluntary public service, including Justice of the Peace for the Borough and City of Leicester, Chairman of the local General Commissioners for Income Tax, Trustee of the Leicester Savings Bank, and Chairman of the Governors of the Wyggeston Hospital Foundation. In addition to his service as President of the Lit & Phil in 1916-17, his sister-in-law Agnes Archer Evans and nephew William Evans had been Presidents of the Society in 1913-14 and 1914-15 respectively, and his son, Colin Dare Bernard Ellis, was President in 1934-35.